We've all been there at one point in time....it's the dead of winter, the mercury on the thermometer is below freezing, and the furnace just went kaput? You can probably fill in your own personal story, but one thing's for sure: home repair emergencies never come at a convenient time, and certainly not during normal business hours. 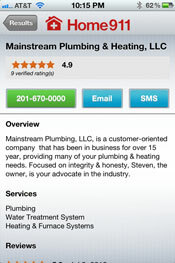 HomeAdvisor, who you may have formerly known at ServiceMagic, recently released a free app for iOS called Home911 as part of a suite of new services to make it easy to find pre-screened repair professionals that can service your home; covering dozens of categories or repair issues from a leaking roof to plumbing problems to a broken refrigerator. Home911 allows you access to what's appropriately called their Home911 Homeowner Emergency Line, which provides live customer support 24 hours a day, 7 days a week. The app gives you two options–find a professional by doing a search on the app yourself, or you can click the call button located at the bottom of the screen to be connected to a specialist. The app does a nice job from start to finish in helping you find an appropriate contractor, including covering off on the basics right up front, by asking for your phone and address, something that you'll need to input at some point later down the road anyway. It provides tools within the app to upload pictures and add comments about your issue - something that can help the contractor assess the problem before they even arrive, because there’s nothing more frustrating than hearing the words "I'll don't have the part in my truck, I'll need to come back later." Lastly, you can select the contractor you're interested in and you land on a page with an overview of the business, reviews from past customers, and up to three options to reach them either by phone (just click to call), SMS, or email. One more thing, you can get quick tips on a number of different issues that may be causing you problems around your house and a potential diagnosis, think of it as WebMD for home improvement. Not ready to take action quite yet? 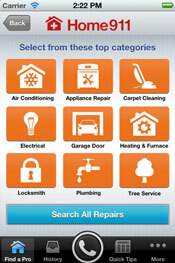 Home911 will store your searches in its history so you can always go back without starting from scratch. If you want a handy and portable way to look for a service professional in a bind, or just need some work done on your home, this is an app worth checking out. How does one go about having their name/business added to this list? Any plans to make this app for any other operating system? A business can get listed with us by signing up to advertise. The company must pass a background and screening process before they get approved and after they are approved we collect ratings and reviews from customers who use them through our system. We are planning on expanding out to the Android operating system in the future. As of right now the Home911 App is only available for I-Phone but stay tuned! If either of you have any further questions, please feel free to contact me directly at 303-963-8066 or mblack@homeadvisor.com.